WASHINGTON - Everyone Osama bin Laden ever wrote to, spoke to or even mentioned in the volumes of correspondence seized from his Pakistan hideout is under new scrutiny, U.S. officials say. Surveillance has been stepped up on possible terrorist targets around the world, as intelligence experts near the end of decrypting and translating material seized from the bin Laden compound. The trove of material has helped fill in the blanks on how known al Qaeda operatives work and think, and where they fit in the organization. The CIA and other U.S. counterterror agencies have sharpened their focus on some midlevel members of the group who they now believe may be more important than originally thought, after reading their exchanges with their fallen leader. The al Qaeda terrorists are keenly aware America is watching, and one official said at least two changed travel plans to avoid becoming the target of another Navy SEAL raid or some other form of U.S. counterterrorist action. The increased surveillance is the result of five weeks of round-the-clock work by a CIA-led team of data analysts, cyber experts and translators, who are "95 percent done" decrypting and translating the material and expect to finish by mid-June, according to two U.S. officials. All officials spoke on condition of anonymity to describe the ongoing review of the now-classified bin Laden files. Items taken by the SEALs from bin Laden's second-floor office included a handwritten journal, five computers, 10 hard drives and 110 thumb drives. FBI Director Robert Mueller told Congress on Wednesday that one of the early assessments from the trove is that al Qaeda remains committed to attacking the United States. "We are focused on the new information about the homeland threat gained from this operation," Mueller told the Senate Judiciary Committee, which is considering legislation that would extend Mueller's job for up to two more years. There is nothing in the bin Laden files so far to indicate an imminent attack, three officials said. But American spies are pursuing what one official called "new avenues of research" into potential new al Qaeda targets that are mentioned in the files. And the U.S. has increased its vigilance regarding some of the targets bin Laden suggests to his operatives, from smaller U.S. cities to mass transportation systems, to U.S. embassies abroad and even oil tankers in the Persian Gulf. A law enforcement official briefed on the process said that investigators have been analyzing raw digital data found on multiple hard drives and flash drives and that some of it consists of sequences of numbers. Investigators were trying to discern potential bank account or phone numbers that might point to al Qaeda contacts in the United States or elsewhere, or codes that could produce other leads. Especially useful in the communications between bin Laden and his followers from Asia to Europe to Africa is the light they shed on the personalities of known al Qaeda operatives and what drives the various terrorist commanders who corresponded with bin Laden. Like an email chain showing office politics, with various members of the hierarchy weighing in and sometimes back-stabbing each other, the communications show different officials vying for the boss' attention and working the system, the officials said. Some proposed daring raids aimed at causing mass casualties, patterned after the Sept. 11, 2001, attacks, while others proposed smaller targets to circumvent increased security measures worldwide. While bin Laden continued to laud the merits of large-scale attacks, the records show he also embraced the shift to smaller operations carried out by Yemen's al Qaeda in the Arabian Peninsula as a way to retain the broader organization's image as a viable terrorist group able to strike U.S. targets, officials said. It's not clear that any of the affiliates who were proposing some of the larger-scale attacks had the ability to carry them out, one of the officials said. After the initial proposal of an idea, there were no follow-up proposals in the trove describing specific resources available to go after a suggested large-scale target. And while the al Qaeda chief advised his operatives on targets to strike and helped them devise ways to hit those targets, there is no evidence in the files that any of the ideas bin Laden proposed led to a specific action that was later carried out. For instance, though bin Laden advised Europe-based militants to attack in unspecified continental European countries just before Christmas, the threat never resulted in an actual attempted attack. There were small-scale violent incidents in Denmark, where bin Laden had repeatedly encouraged followers to attack because of disparaging references to the Muslim prophet Mohammed in Danish media. But he did not seem to be involved in planning the specific incidents, the officials said. As for bin Laden's suggestion to hit oil tankers, there is an indication of intent, with operatives seeking the size and construction of tankers, and concluding it's best to blow them up from the inside because of the strength of their hulls. In a confidential warning obtained by The Associated Press, the FBI and the Homeland Security Department said al Qaeda operatives also recommended test runs, but there's no evidence the plot went any further. They have also shared some of the information with Pakistan as part of an effort to renew cooperation with Islamabad in the wake of the bin Laden raid, U.S. and Pakistani officials said. The U.S. hid the operation from Pakistan for fear that the raid plans would leak to militants, but the unilateral action brought protests from Pakistani leaders over what they called an affront to their sovereignty. 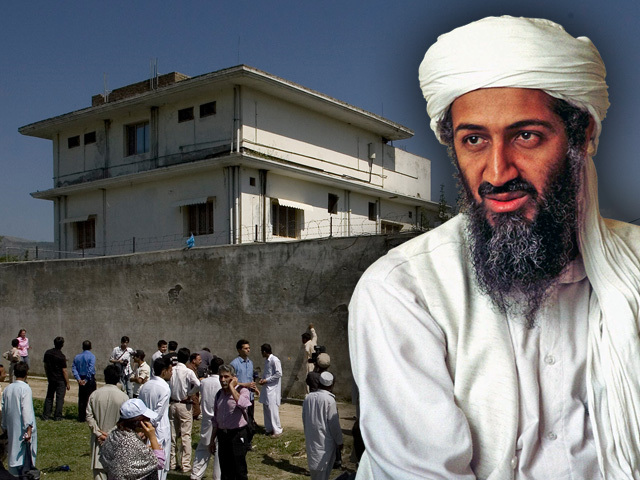 After that outreach, Pakistan allowed the CIA to re-examine the bin Laden compound. Pakistan also returned the tail section of a U.S. stealth Black Hawk helicopter that broke off when the SEALs blew up the disabled aircraft to destroy its secret noise-and-radar-deadening technology. The investigative team, made up mainly of intelligence officers from both nations, is comparing the CIA's analysis of computer and written files with Pakistani intelligence gleaned from interrogations of those who frequented or lived near the bin Laden compound, the officials said. Pakistan's intelligence service has been interviewing those who spent time at the compound, from a guard who used to do the compound's grocery shopping, to an extremist sheik who came in weekly to teach the 18 children that Navy SEALs counted at the compound the night of the raid. Some of the roughly two dozen surviving residents told Pakistani intelligence they subsisted on a weekly delivery of one goat, which they slaughtered inside the compound, plus milk from a couple of cows kept in the courtyard. There were also eggs from chickens that roamed the courtyard and vegetables from a small kitchen garden. Bin Laden's upper apartments were bare of paint or adornment on the walls. There were only two beds, a double and a single, both of poor quality, one Pakistani official said. Officials haven't determined the sleeping arrangements for bin Laden and his three wives among the beds, he added. Bin Laden's rooms did have the only air conditioner in the compound, in a region where summer temperatures can top 100 degrees. There were no heaters, despite winters where temperatures can drop to freezing. That could explain the blanket bin Laden clutches around him in one of the videos taken from his office.